My purpose for this blog, if one is required, is to keep the world - mostly family and friends - abreast of the glorious banality that is my life. 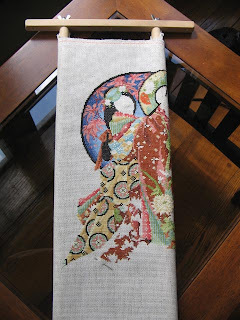 I plan on sharing with you my various craft projects, and my varied interests. 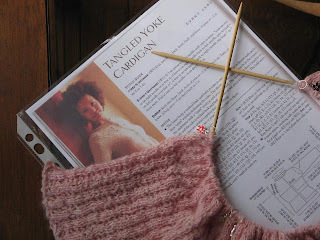 To begin with I'm working on the Tangled Yoke Cardigan from the new issue of Interweave Knits (Autumn 2007). 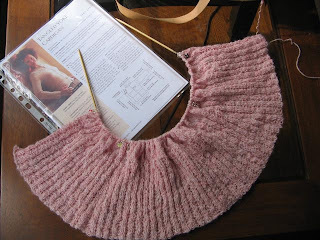 I'm knitting it in two strands of Knitpicks Alpaca Cloud - the pale pink shade. I believe its called Peppermint Heather. I've worked with this yarn before and am always amazed at both its softness and strength, its also fantastically inexpensive. 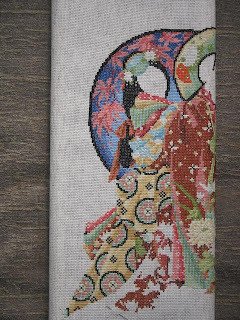 Also, I'm working on a cross-stitch called Wisdom from Joan Elliott's book Oriental Odyssey. This project will be quite a long time in the making, but I will update my progress from time to time with photos. Deary, deary. I've been struggling to create this post for hours. I'm going to take a long, hot bath and eat some chocolate. I'll post again someday soon. My Alpaca Cloud Peppermint Heather just arrived about 1/2 hour ago. I love the yarn and the color. Your cross stitch is lovely. I can't wait to see the finished project. The cardigan is staying on the needles until its finished. This time.